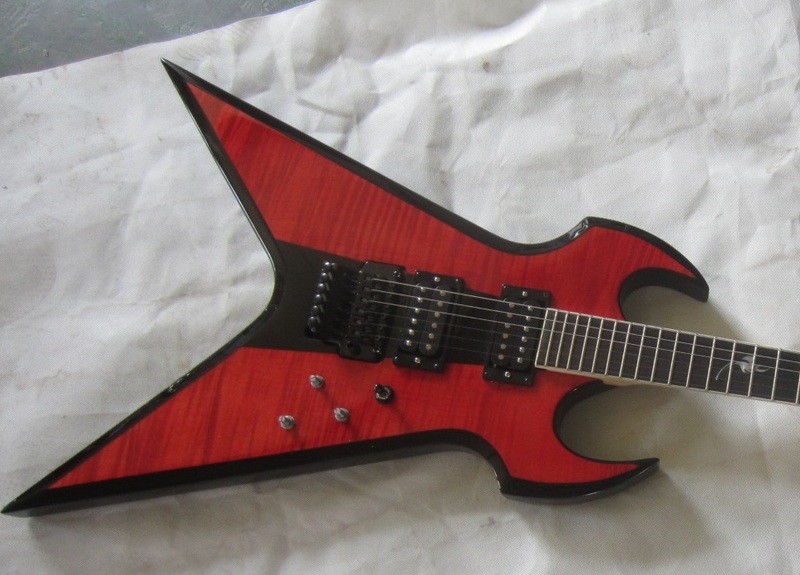 Pre-order your custom Fireplant Guitar while we're in production and save $100 or more. Choose from the flagship, trademarked Fireplant FP-1, our ultra badass flying V, the WMD-V, or the most menacing electric guitar on Earth, the Fireplant Guitars Splitsville in either the standard finish or the Splitsville WMD-V finish. We also do custom bass guitars, too - anything from 4-, 5-, 6- or even 7-string basses. Any of our body styles are fair game for a badass, custom bass, so just let us know which one you want. Choose the finish, number of strings and top wood (flame maple, quilted maple or solid paint color). Fireplant Guitars Splitsville WMD: black beveled edge and see-thru red finish on flame maple. 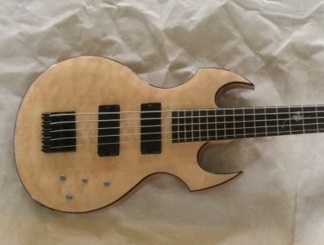 Custom Fireplant FP-1 5-string bass: Quilted maple top, clearcoat finish and black body binding. First off, keep it reasonable, daddio - nothing too crazy... but we'll listen to what you have to say. You never know 'til you ask, right? We made the models to the right for some customers of ours. The top one came from a badass guitarist who wanted something different than everything out there, but not quite as different as our main, custom guitar shapes. 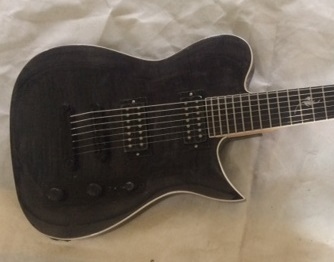 He wanted a 7-string, but he wanted something like a Tele... but not too much like a Tele. He thought it would be cool to have an LP, too, but not too much like an LP. He liked the horn on a standard LP, but he also liked the horn on the FP-1. So, we compromised on his order and got him the perfect mix of everything he wanted. In fact, we like it so much, we may reproduce it. Stay tuned for that news! The next one is a "duh." 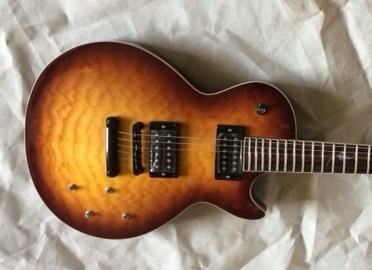 It's a pseudo-replica LP, but with our own take on the burst finish on top. We also included the Fireplant leaf on the 12th fret like we always do, and we put our signature Fireplant headstock on it to really set it apart from the LP crowd. 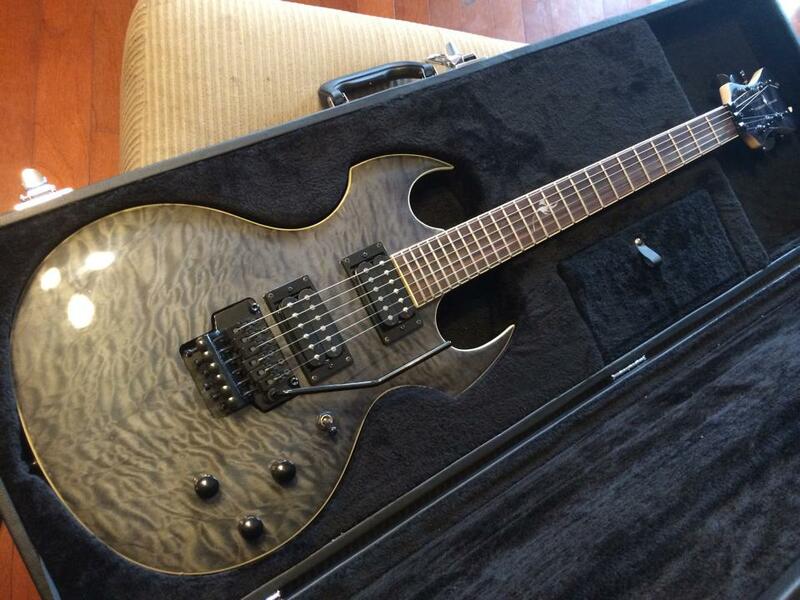 Fireplant Guitars FP-1 Custom in see-thru black on a quilted maple top. 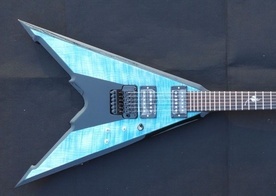 Fireplant Guitars WMD-V in black edge paint and see-thru blue on flame maple. 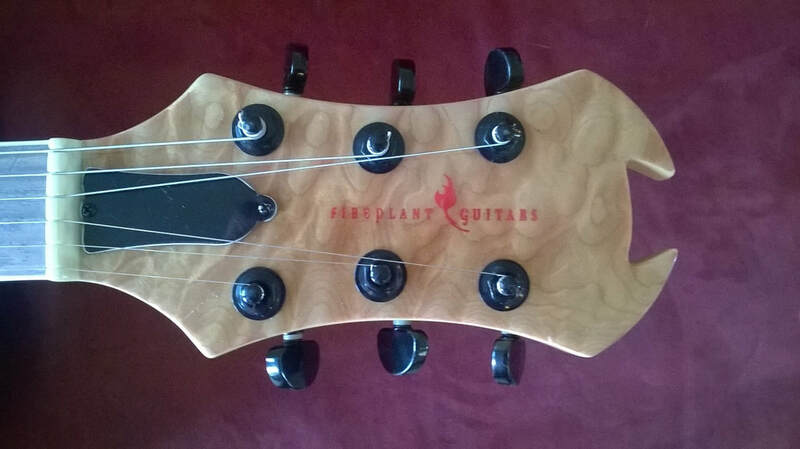 Fireplant Guitars custom, signature headstock design. Endorsements for Badass, Gigging Guitarists! If you're an actual gigging guitarists with some recorded stuff to share with us, let us know! We may be able to save you some cash, even if you're just playing dive bars and cafe's right now. Our goal is to help real, gigging guitarists get kickass gear that they can afford so you can make it big. The guys who already sell out arenas don't need our help, but you do so you can get that far. If you're a kickass, fearless guitarist on your way up, check out our endorsement page here. Don't be shy - you're not shy on stage, are you? You're not shy to share your music with the world, right? Give it a shot, kid - you never know!